Jesuit Fr Terry Howard has been involved for the past five years with the ‘Ethical and Shared Remembering’ project which has delivered cross-community education and training in Northern Ireland about the 1912-1922 period in Irish/British history. Now the training based on the programme pioneered by The Junction, Derry/Londonderry is to be made available in Dublin. 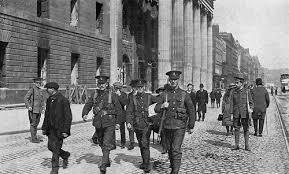 The course ‘Ethical and Shared Remembering: Remembering a Decade of Change and Violence in Ireland 1912-1922 will be delivered by the Irish School of Ecumenics at Trinity College beginning on Thursday (23 April). During the decade events occurred that have shaped 20th century Ireland and still cast long shadows over relationships. That decade of change and violence in Ireland has left legacies and there are themes and issues that still need to be addressed. The course specifically seeks to deconstruct the ideological, philosophical and religious views of the decade in order to reconstruct an ethical value base for the 21st century. The course has been highly acclaimed and President Michael D Higgins has taken a personal interest, reading the course material and quoting from it in some of his recent speeches. Fr Terry Howard sees the course as important for anyone who wishes to deepen their understanding of what was a crucial decade in the history of this Island. “I have availed of this course myself on a couple of occasions and cannot recommend it highly enough. It will not only broaden an understanding of the issues if 1912-1922 but it also, in a roundabout way, directly addresses the issues of today by looking (safely) at the past,” Fr Howard said. Dr Johnston McMaster and Dr Cathy Higgins, both Adjunct Assistant Professors at the Irish School of Ecumenics, write and deliver the material of the course. They are employed by ‘The Junction’, a community relations centre in Derry/Londonderry, that has driven the roll-out of the project in Northern Ireland and who make available the training and course materials for use by the wider public. The Junction has been funded over the past three years by the Columbanus Trust. This trust was established in 2003 in the wake of the closing of the Columbanus Community, a cross community initiative established in Belfast in 1983 through the vision and hard work of Fr Michael Hurley SJ, who passed away in 2011. The course in TCD will run for five consecutive Thursdays (from 10am to 4pm each day). An interactive approach will be applied in relation to the course, in which all are educators and learners. The themes of the sessions are ‘The Ethical Framework and the Decade in Global Context’; Integrating Complexity and the Ulster Covenant’; ‘Easter Rising, Blood Sacrifice and the Somme’; ‘Shaped by Patriarchy and Literary Responses’; and ‘War of Independence, Partition and Civil War’.